The Pro-Tech Steel Edge Sno Pusher is becoming increasingly popular among snow and ice professionals that are looking to remove hard pack and reduce salt usage. The simple but effective poly-trip-hinge design works in tandem with the pivoting wear shoes and suspension to allow for aggressive scraping. This design aids the 24″ cutting edge sections in contouring to the surface. Also, unlike some other steel edge containment plows, the Steel Edge Sno Pusher’s fully welded construction eliminates speed or stacking restrictions. With minimal moving parts and a 10 year warranty, the Steel Edge Sno Pusher offers the durability and results that are synonymous with Pro-Tech products. 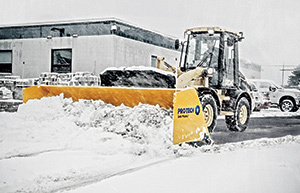 The Steel Edge Sno Pusher is available in loader, backhoe, and skid-steer models.